One of the great promises of iOS 3.0 was the External Accessory framework, which would allow a multitude of accessories to interface with Apple’s 30-pin dock connector port. It’s been slow in coming, but at long last those classic serial ports of yesteryear (such as RS-232) can finally connect to your iOS device. Redpark has announced that serial cables for the iPhone, iPad and iPod touch are now shipping, making it possible to connect to a variety of typically incompatible devices such as point of sale, scientific instrumentation, industrial process control equipment, networking equipment and devices used in home and office automation. "We completed development of our first cable products this month,” explained Redpark president Mike Ridenhour. "We have worked within Apple's ‘Made for iPod’ program to develop the cables. As a result, there is no need to jailbreak the iPhone.” To qualify for Apple’s strict “Made for iPod” policy, each cable will be engineered for a specific purpose, Ridenhour elaborated. 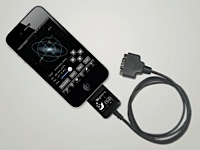 The first such cable is the Southern Stars SkyWire, which works in conjunction with the SkySafari app to turn an iOS device into a 21st century telescope controller. SkyWire is apparently just the beginning, as Redpark is opening its doors to iOS developers everywhere and providing them with custom serial cables for specific purposes. "We will need to work in conjunction with each app developer to get their app working with a cable and to complete the necessary approval processes,” Ridenhour explains. Developers are encouraged to contact Redpark Product Development for further details.